Mom's Gone Bronson! : Yves Rocher Holiday and Winter Collections, Just in Time for Christmas! Yves Rocher Holiday and Winter Collections, Just in Time for Christmas! Limited Editions, making the holidays special! 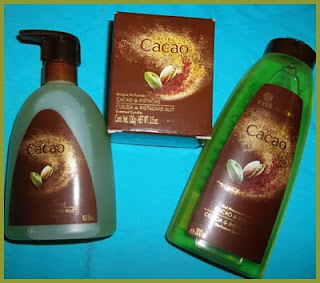 Their Cacao line this Christmas is AMAZING and I personally love the smell of Cacao and Pistachio, which I have in a body wash, hand wash and a scented candle - nothing like a hint of nutty chocolate to bring a little sweet delight to the cold, dank winter! The wash is gentle and smooth and doesn't leave a sticky residue, which is delightful, as always and the hand wash just the same! I love to leave the soaps in the kitchen to give it that little sweet zing to the air after baking or washing dishes instead of the soapy dishwashing-liquidy-lemon smell we all have come to love when just reaching for the dish soap! I pop a candle or two up in my living room each year and use them a lot more in the winter, which makes these seasonal gifts so much more relevant in my household than ever before - I just can't get enough of these and I love to point them out to people when they stop by!! All scents come with a selection of goodies to choose from such as body wash, hand soap, scented candles, sprays and even a lip balm and lotion! Alongside the Cacao collection you also have the Vanille Collection, which presents notes of vanilla via a body wash, candle, Eau De Toillette, body lotion and a bath cube - you can buy these one piece at a time or put them together to make a delightful gift basket! As ever, Yves Rocher also have a seasonal make up collection to keep you on your toes and looking your best through the holidays and I had the pleasure of trying out a couple of their Winter "Romantic Heroine" collection lip sticks, a double ended kohl pencil and a mascara! I love the soft colors offered such as peacock blue/stormy blue double liners and the range of red, blue, mauve and green this season! I really would have loved to have tried more, and really do hope that I get a chance to pick some up before the season is out! I can't resist a smokey eye and a soft, shimmery blue! 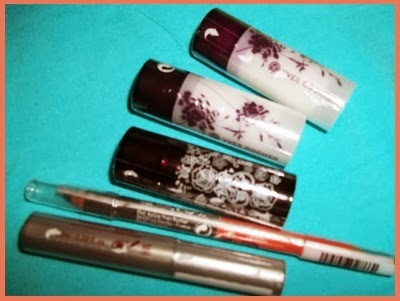 These lipsticks are smooth, delicate and colorful, true to the swatch on the cap and long lasting! Available in several shades, I love the reds - big and bold this year for Christmas! You can check out the entire Winter line HERE for more details AND to discover shimmer water, which I am quite excited to pick up, myself! It leaves shimmery particles on your skin, which is fabulous for special occasions and I can't wait to try it! I love just about everything Yves Rocher comes out with and it really seems as though they can do no wrong in my eyes! Their prices are phenomenally reasonable, too and so you can get a good look with a small cash-flow! Great for you or as a gift this season, which is of course why Yves Rocher also makes it into our Holiday Gift Guide for 2013! I hope you head on over to Yves Rocher and check out their full line of goodies and let me know if you get to try any! I love hearing from you! Disclaimer: I was provided items in return for this review. All thoughts and opinions are mine alone and your views may differ! Thank you!